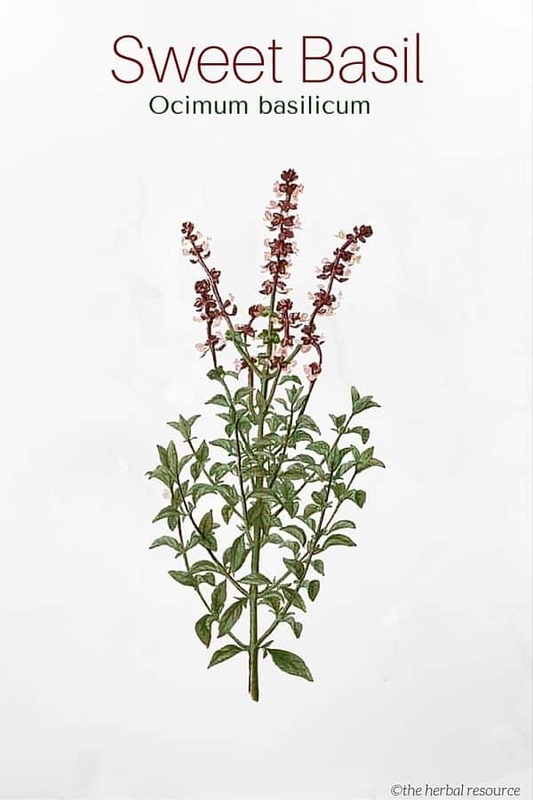 The low-growing bush basil (Ocimum minimum) is a separate species, but it is probably a variant of sweet basil. 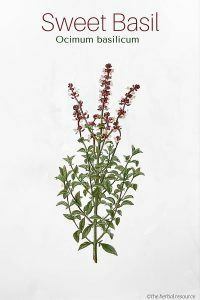 Much of the herb grown today is a hybrid, a cross between Ocimum basilicum and Ocimum americanum. There are many cultivars of basil that have their own denomination. Habitat: The plant is endemic to India, the Middle East and some islands in the Pacific. Today, it is grown in all parts of the world where there is a warm or temperate climate. The herb has been cultivated in the Mediterranean countries for thousands of years. Description: Sweet basil is an annual plant, 20 to 50 cm tall of the family Lamiaceae. It has upright, square stems with many side branches. The leaves are broadly oval with a peak and come in pairs up the stem. The leaves are usually bright green, but purple-colored versions exist. The plant blooms in late summer. Plant Parts Used: It is usually the leaves that are used in herbal medicine, but sometimes all of the aerial parts of the herb are used. It is preferable to use the herb fresh because it loses much of its flavor when dried. It is often added in oil or vinegar. The plant contains 0.2 to 1 percent essential oil, which consists primarily of linalool and methyl chavicol, but it also contains small amounts of cineole, methyl cinnamate, and other terpenes. Other constituents include tannins, monoterpenes, sesquiterpenes, and phenylpropanoids. Sweet basil is a highly aromatic herb, which in addition to its use in cooking also has its uses in herbal medicine (both the herb and the essential oil extracted from it). The plant is devoted to the Hindu gods Krishna and Vishnu and can often be found cultivated around the temples where those gods are worshipped. It is said that sweet basil was found growing around Jesus’ tomb after the resurrection, and the Greek Orthodox Church uses it in the holy water. In Greece, it is quite common to see the herb planted in front of houses since it is believed to bring good luck. In Western Europe, during the Middle Ages, it was considered the devil’s herb and used in potions to protect against witches. It has been used traditionally to alleviate and treat flatulence, abdominal cramps, colic, constipation, and indigestion. It can also be used to prevent nausea and vomiting, and to rid the body of intestinal worms. Basil has a mild soothing and sedative effect that could make it useful in the treatment of nervous irritability, depression, anxiety and sleep difficulties. 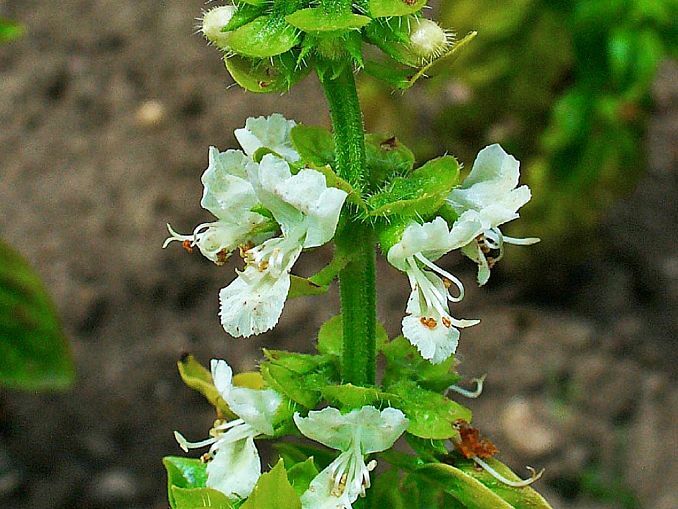 Ocimum basilicum has antispasmodic, antiseptic, expectorant and antibacterial properties and it can be used for epilepsy, migraine, and fever associated with colds and flu. Additionally, the herb has a slight diuretic effect and has sometimes been used to treat arthritis, rheumatism and urinary problems. The plant is traditionally used to increase production of breast milk in lactating mothers. Sweet basil may lower sugar values in both blood and urine. A 62-patients study, which was published in 1997, showed that consumption of basil reduced the amount of glucose by 17 percent compared with a control group that received a placebo. The amount of cholesterol and sugar in the urine were also reduced, but not significantly. More and larger studies are needed to determine whether basil may have a value as a glucose-lowering agent for diabetes patients. The fresh leaves have been used as an insect repellant and the juice extracted from the leaves is used to treat snake bites and insect stings. Used as a tea or a mouth rinse mixed with water, the herb can be used as an herbal remedy to relieve cough, whooping cough and sore throat, and fresh leaves can be chewed for fresher breath or to get rid of bad breath. The leaves have been used to remove warts and other skin blemishes. The herb contains many viral inhibitory substances, which explains this traditional use. 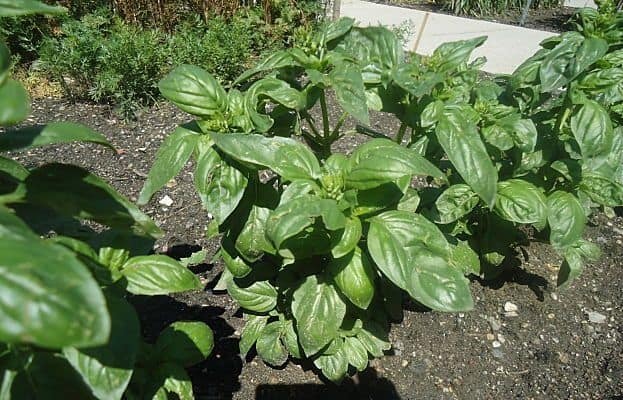 In many cultures, basil is regarded as a herb to promote menstruation, induce labor and as an aphrodisiac, but no evidence exists to substantiate this use. As a tea – 2 tablespoons of fresh ground leaves to one cup of boiling water. Steep for 15 minutes and then strain. Drink 1 to 2 cups daily. Because sweet basil can enhance the effectiveness of insulin and blood glucose-lowering medications, people with diabetes and those using such medication should use the herb with caution and only under the guidance of a professional health care provider. Hobbs, Christopher: Herbal Remedies for Dummies. Foster City, California. IDG Books Worldwide 1998. Fetrow, Charles W. & Juan R. Avila: Professional’s Handbook of Complementary & Alternative Medicine.Springhouse, Pennsylvania. Springhouse Corporation 1999.